From The Architect and Contract Reporter, October 2 1869: The site of the New Pro-Cathedral at Kensington is, unfortunately, not all that could be desired; at any rate, as things now exist. It was formerly the playground of a large school, and forms a hollow square surrounded by houses, with a very narrow and inconvenient access from the Kensington and Hammersmith highroad, nearly opposite to the Holland Park gates. Eventually, no doubt, the property which now cloaks the principal facade of the church will be nought up and removed, and to this view the end elevation has been carried out with considerable architectural character. The plan consists of nave and aisles, spacious apsidal choir, side chapels, sacristies, and a chapter room. Owing to the limited width of the site, the width of the church is only 60 feet, with a total length of 155 feet. The style is thirteenth century Gothic, treated with a certain and legitimate freedom in its adaptation to the material””brick””of which the fabric is mainly constructed. Exteriorly great simplicity has been observed, excepting in the principal entrance, a magnificent doorway, which, by its size and dignity, fittingly symbolises the sacred words ‘Ego sum ostium,’ opens across the whole width of the nave from buttress to buttress, whilst over its projection runs a parapet of pierced stonework, behind which is the great western window. A lofty wooden spirelet, with angels standing about its base, forms a striking feature, and marks the extent of the choir on the long and otherwise unbroken ridge of the chief roof; it rises to a height of 135 feet from the ground level. In the interior, ornament has been applied with a less niggard hand, though with a very judicious sobriety and taste. 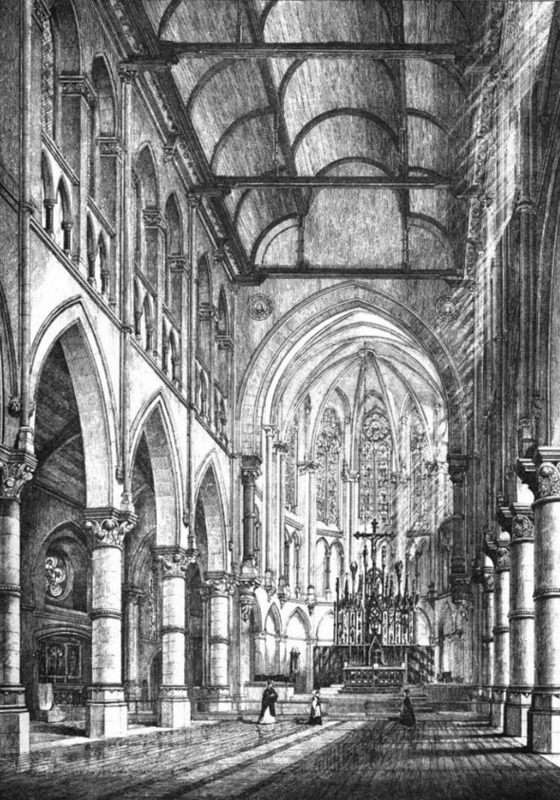 A magnificent arcade of polished granite columns, surmounted by richly sculptured capitals, and bearing lofty stone arches, carries the eye onwards to the choir, which, raised by a dignified ascent of steps above the nave level, sweeps round with its arcade and great crown of nine lofty windows, and embraces at its extremity the high altar, composed of costly foreign marbles, but as yet wanting its reredos. All other fittings, and the softening effects of stained glass, are wanting. The total cost of the completed church will be about 12,000.